In the just-concluded 'Operation Maitri' in the quake-hit Nepal, the Indian Air Force and the army flew 2,223 sorties, shifted about 11,200 people to safer places and transported and dropped about 1,700 tonnes of relief material. Rapid Action Medical Teams of armed forces extended medical assistance to 4,762 injured -- 300 cases of surgery, 216 hospital admissions and 4,174 OPD cases. The mammoth Humanitarian Assistance and Disaster Relief task, carried out by the IAF and the army since April 25, came to an end on Thursday. Within four hours of the devastating earthquake, the IAF swung into action and routed one C-130J aircraft, two C-17, one IL-76, airlifting 295 National Disaster Response Force personnel, 46.5 tonnes of load and five sniffer dogs. IAF aircraft that took part in the operation included heavy lifters C-130J Super Hercules, C-17 Globemaster III, IL-76 Gajraj and medium lifter An-32. Besides these aircraft, eight Medium Lift Helicopters (MLH) which included Mi-17 V5 and Mi-17 took part in the operation. Large-scale relief and rescue operations were carried out by Mi-17 V5 and Mi-17 helicopters from detachments at Pokhara and Kathmandu. These operations were carried out in remote and inaccessible areas. The Engineer Task Force of the army has cleared and constructed tracks in difficult and inaccessible areas to facilitate relief work in Barpak, Gorkha and Kathmandu. The ETF cleared over 16 km of track, over 11,477 cubic metres of debris, helped to re-construct 55 houses/shelters and recovered several bodies, an official statement said. 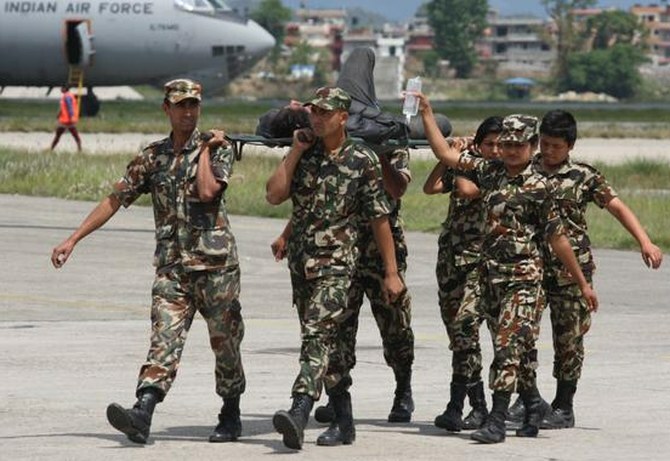 Army aviation pilots flew continuously to evacuate stranded and injured people, provided relief material and inducted 567 Nepalese army troops to reach inaccessible areas to carry out relief work. The army provided 10,000 blankets, 1,000 tents and 1,000 tarpaulin/plastic sheets. The Indian Army's Everest Expedition team which was located at the Everest Base Camp when the earthquake struck rescued a number of mountaineers who were affected by an avalanche, triggered by the quake. They helped in recovering 18 bodies and the team doctor rendered critical medical aid to several mountaineers before they were evacuated by air.